This Budget of Fun cartoon accuses Democratic presidential nominee George B. McClellan of aiding the Confederate cause. 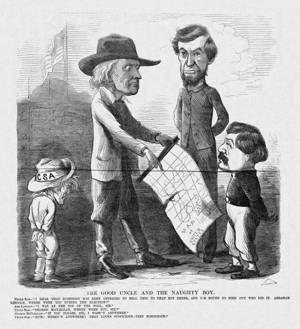 Uncle Sam points to a map of the United States, which the tearful boy, McClellan, denies tearing to give to the hand-tied boy representing the Confederacy. The tall, manly Abraham Lincoln replies that when the event occurred he himself was “at the top of the poll”—i.e., had won the presidential contest.